During the last months at Igalia we have been working on optimizing open source components for the MIPS architecture, using the SIMD instructions supported by the latest MIPS 74K cores. More specifically, I have been working on the Qt framework. One of the most used parts of Qt are the basic utilities in the QtCore module, being QString a basic building block that all applications are expected to use heavily, so making it faster would be a gain for any application. One of the functions I first worked on is QString::fromLatin1: it converts an array of characters in ISO–8859–1 encoding (also known as “Latin 1”) and returns a QString object, which internally stores text data in UTF-16. The most important thing to do is unrolling the loop, but some care is needed: as Thiago Macieira mentions in one of his articles, in average most of the strings in Qt have a length of 17 characters. This means that doing a long unrolling of the loop could be worse because of the calculations needed to determine how many times the unrolled loop is executed and the handling of the remaining items. The first thing to do was making two versions of the algorithm: one with the loop unrolled 4 times, the other with it unrolled 8 times. Note that the actual implementation is longer, handles the extra items remaining after the unrolled loop, and has a preamble to make the pointers aligned—which, most of the time, is worth to do. Qt: This is the original code included in Qt, which is s simple pull-up operation that converts chars to short integers. The code was built with -O2 -march=74kf -mdspr2 to get the best possible optimizations from GCC. lbu+unroll8: Loads each character using lbu (byte load) instructions, stores results using sh (store halfword), and the main body of the loop is 8-unrolled. It also uses cache prefetch hinting for both source and destination memory areas. lw+unroll4+dsp: The main body of the loop is 4-unrolled, using lw instructions to load aligned words, DSP instructions to unpack bytes into halfwords, and finally store results with sw instructions. 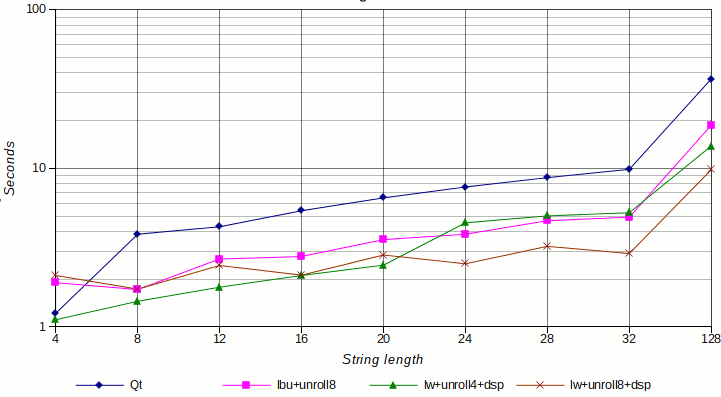 lw+unroll8+dsp: Similar to the previous one, main body is 8-unrolled, and if the source address is not aligned, up to three bytes are consumed before starting to use lw instructions to load aligned words. All the optimized versions perform better than the simple Qt version, being the speedup up to 3.x (note: the time scale in the graphic is logarithmic). For strings up to 20 characters, the 4-unrolled function performs clearly better, because of the small data set and the fact that it avoids the additional preamble used to align the source pointer address. Also, some string lengths (4, 12, 20) can be better handled by the 4-unrolled loop because the lengths are not divisible by 8. For strings bigger than 20 characters, the 8-unrolled with aligned loading version is the best, and it reaches a 3x speedup for strings longer than 32 characters. For longer strings, the speedup is maintaned and becomes clearer as string are longer. With this data, we can conclude that the best implementation is an hybrid approach, using both the code for the 4-unrolled loop and the 8-unrolled loop, and selecting one of them depending on the length of the input data. Checking the length of the input string and branching takes just two extra instructions (slti and a bnez), which is okay to have in the function preamble because it is not costly. Wrapping up, the final version is up to 3 times faster than the original Qt implementation, without sacrificing the speed for the rather common small strings. Last but not least, I would like to thank MIPS Technologies for sponsoring this work, and for making it possible to have a development board at Igalia for testing and benchmarking.